A roundtable discussion commemorating the 30th anniversary of the Chornobyl nuclear disaster was held at the U.S.-Ukraine Foundation (USUF) on April 26, 2016. The panelists were Valeriy Chaly (Ukraine's Ambassador to the U.S.), Mykola Riabchuk (a prominent Ukrainian writer and literary critic), and Nadia McConnell (President, U.SUF). Ms. McConnell, recalled the Soviet information blackout about the catastrophe and how only a week after the explosion, while radiation continued to spew from the damaged reactor, the May Day parade in Kyiv went on as planned with thousands of people of all ages exposed to Chornobyl's radioactive cloud. She said for her, the biggest lessons from the Chornobyl disaster pertain not to the issue of nuclear safety (which, certainly, is important) but rather to how a totalitarian state deals with a catastrophe versus the response of an open society. She drew a stark comparison between the Soviet cover up of the nuclear accident at Chornobyl and the quick and comprehensive Japanese and international response to the Fukushima power plant crisis. "I don't think that we in the West have learned any lessons about Chornobyl because again when anybody talks about Chornobyl... nobody really talks about the cover up, the understanding of the cover up. The fact that this is a consistent playbook by the Kremlin and we see it today with the war--denial... We don't really discuss the real tragedy of Chornobyl." Ms. McConnell also noted that pledging conferences that have been convened to assist the victims of Chornobyl as well as the victims of Russia's war against Ukraine have never met their goals. For Ambassador Valeriy Chaly the Chornobyl disaster had a deep personal dimension. His father was a Chornobyl "liquidator"-the title given to thousands who were involved in the rescue, containment and clean-up operations surrounding the nuclear power plant-and was also involved in establishing a museum devoted to Chornobyl. Ambassador Chaly said that Chornobyl is a symbol of the old Soviet style of governance and is an important reminder of the failed Soviet culture of security lapses and suppression of news and information, as a well as a general lack of respect for human life. According to Mr. Chaly, Ukraine's experience with this nuclear tragedy has made it a constructive contributor to nuclear non-proliferation efforts, including giving up its nuclear arsenal and cooperation with the International Atomic Energy Agency (IAEA). Ominously, there are concerns that Russia may deploy nuclear weapons in the Crimean peninsula, which it annexed from Ukraine in 2014. Ukraine still relies on nuclear power for generating a large portion of its electricity and needs additional international support for completing the Chornobyl containment structure and dealing with other aspects of the aftermath of the disaster, explained Valriy Chaly. In his presentation, Mykola Riabchuk reminded the audience that "liquidators" were being sent to quell the disaster without any gear to protect them from lethal doses of radiation. They were being sent to their deaths as the Soviet system did not care about human lives. The Chornobyl disaster had huge political ramifications for the closed Soviet system, says Mr. Riabchuk: "This silencing of the disaster largely contributed to the opening of the Soviet system, because people both within the elite and within society, people who favored this opening, they had an additional argument, to say 'see what happens in a closed society.' A closed society is dangerous for its own citizens, for its own people. So I think it was a very important argument within the reformist camp to push forward this idea of opening, of glasnost." Glasnost became a topic in the aftermath of the disaster. In Ukraine "it disclosed the very cynicism of the imperial center, how harmful this dominance of Moscow was." Mykola Riabchuk, who was residing in Kyiv at the time, recalls how he learned about the Chornobyl catastrophe from his father, who was living in Lviv. His father heard about the Polish government's rapid response to Chornobyl on Polish radio and more and more Ukrainians soon came to learn about the seriousness with which neighboring countries were trying to mitigate the impact of Chornobyl's radiation. This showed that Polish government, unlike the Ukrainian government, cared about its people, says Mr. Riabchuk, while the Ukrainian government - "they were just puppets of Moscow." And whatever nationality you were, those living in Ukraine all suffered from the policies of Moscow -all were in the same boat and this consolidated people. "I think the real drive for independence was initiated by this event," explains Mykola Riabchuk. He went on to say that it also contributed to the emergence of non-governmental organizations (NGOs), the environmental movement, and many other important changes in people's mentality occurred after that. He concluded that people realized that the system and imperial rule were a disaster for all and something should be changed. "I think it was the beginning of the end of the Soviet Union," exclaimed Mr. Riabchuk. Embassy of Ukraine event commemorating the 30th anniversary of Chornobyl. (Embassy website). The Embassy of Ukraine in Washington commemorating the anniversary of the Chornobyl disaster with an event on April 27th. Under Secretary of State for Arms Control and International Security Rose Gottemoeller and Representative Marcy Kaptur (D-OH), a Co-Chair of the Congressional Ukraine Caucus spoke at the gathering. As reported by the Embassy of Ukraine, addressing the audience, Congresswoman Kaptur underlined that "the effects of the disaster linger socially, economically, and culturally and Chornobyl's legacy remains a heavy burden for the people of Ukraine. That is why continued American humanitarian aid in the region is vital." She also reaffirmed the strong support by the United States for Ukraine and its democratic aspirations. 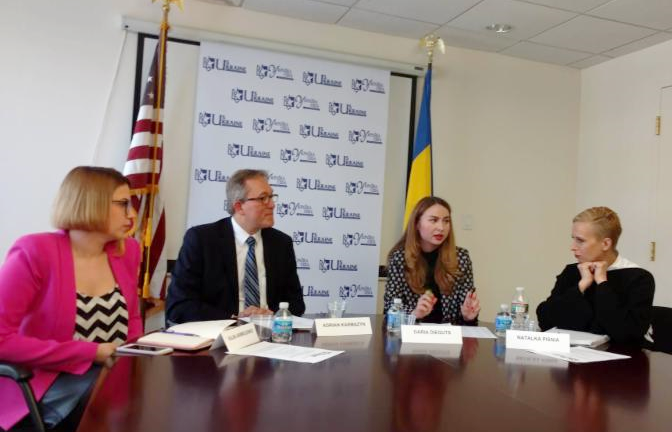 Washington, DC - Olena Honcharova, founder of the Kharkiv Station NGO which assists internally displaced persons (IDPs) in Ukraine, spoke at a U.S.-Ukraine Foundation roundtable on April 25, 2016. She was in Washington to receive the Refugees InternationalRichard Holbrooke Award, given to an outstanding national NGO working with the displaced. She was honored at the Refugees International 37th Annual Dinner, along with Sir Richard Branson and Senator Ben Cardin (D-MD). Regarding the dire situation of hundreds of thousands of IDPs in Ukraine, Olena Honcharova emphasized that there continues to be a great need for clothing, medicine, hygienic products and housing. Finding jobs for IDPs is also an important priority. During her visit to USUF, Ms. Honcharova expressed concern that Ukrainians are getting tired of the conflict and, as a result, private donations of assistance for the IDPs are in decline. She was also critical of what she views as unsympathetic characterizations of IDPs by some Ukrainian government officials. Honcharova criticized the withholding or delay of social payments from residents of the occupied territories who cross the line of contact and come to Ukrainian government-controlled areas to obtain those payments. She stressed that as citizens of Ukraine, they are legally entitled to their pensions, for example. Nadia McConnell (USUF President), Olena Honcharova (Kharkiv Station) and Dawn Calabia (Refugees International) at the U.S.-Ukraine Foundation roundtable (left to right). Olena Honcharova also described the genesis of Kharkiv Station, which grew out of her Facebook campaign to mobilize assistance for IDPs (initially from Crimea and subsequently from the Donbas) and explained that in peak periods her NGO was being visited by some 600 IDPs per day. Many are not getting the help from the government that they need, she said. Ms. Honcharova said that Kharkiv Station obtains support from numerous donors and volunteers and partners with other non-governmental organizations in the region. 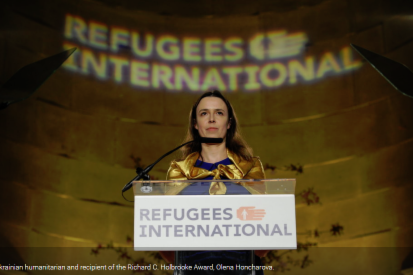 Speaking to the audience of the annual gathering of Refugees International, Olena Honcharova said: "The war in Ukraine continues. And no matter how hard we try we cannot help everyone. Our resources are exhausted. Our society is very tired from the war. And we still need assistance." In an interview with the Voice of America on the sidelines of the awards ceremony, Olena Honcharova emphasized that IDPs, who sometimes come with negative attitudes about the central authorities are quickly won over by the generosity of those who provide them with support: "Even those that have been spoiled by propaganda and who fled to our area and thought that the terrible 'Kyiv junta' is here and that they will be shot and killed, they see in time, when they are treated humanely, by volunteers, by local residents-in time they stop supporting the 'Russian world.' From their own experience they see it is better to live in Ukraine. There have even been families who planned to move to Russia but having interacted with volunteers, having obtained some assistance, have stayed in Ukraine. I met with them later-they are just like us, they have adapted, are living here and are helping others." For more information about the Kharkiv Station NGO headed by Olena Honcharova, visit their website: CLICK HERE. The role of public radio, playing an important role in strengthening democracy in Ukraine, was discussed by seven members of the Hromadske Radio team, during an event at the U.S.-Ukraine Foundation on Monday evening, April 25. The trip was sponsored by U.S. Embassy in Kyiv, Ukraine and organized by Razom for Ukraine. The roundtable discussion was hosted by the U.S.-Ukraine Foundation. Photography was sponsored by Vadym Guliuk. Hromadske Radio is an NGO founded by a group of professional broadcasting journalists who came together in 2013 to launch an independent public radio for the Ukrainian audience. Their tagline is: Listen. Think. Washington, DC, April 18 - The role of media in a democracy is often underestimated. It's difficult to have a system of governance built around the will of the majority without citizens having reliable sources of information. Today we can see that freedom of the press is directly correlated with successful democratic rule. That is why the role of media in post-Maidan Ukraine is of utmost importance. The ability to guarantee freedom of the press and information is one of the key components of Ukraine's democratization process. Roundtable discussions were held at both the National Endowment for Democracy (NED) and the U.S.-Ukraine Foundation (USUF) on Tuesday, April 12th regarding the media in Ukraine. NED's roundtable - which was conducted in a "without attribution" format - focused on ownership of Ukraine's major media outlets. Whoever owns the news has the ability to distort and reshape public perceptions of reality. Thanks to a new Ukrainian law on transparency of media ownership it has been officially revealed that Ukraine's national television networks remain under the control of a handful of oligarchs. The control of Ukrainian media by a select few extends to online news sources as well. This is a particularly disconcerting development as the Internet has been considered by many to be a refuge for independent sources of information. 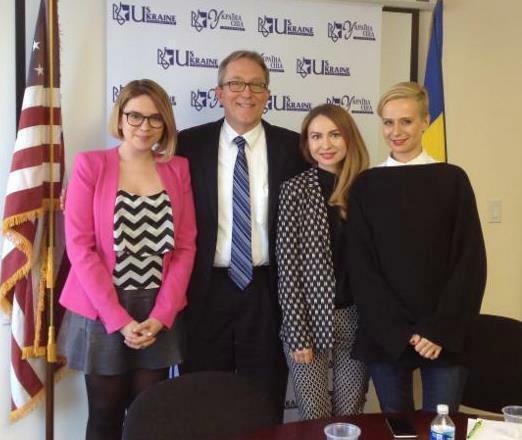 The U.S.-Ukraine Foundation's roundtable discussion featured Washington correspondents who produce stories for some of Ukraine's biggest television networks: Natalka Pisnia from 1+1, Daria Dieguts of Ukraina TV and Iuliia Iarmolenko of Voice of America, which partners with ICTV. Topics ranged from their coverage of the U.S. election to the cultural differences between Ukrainians and Americans. The wide-ranging discussion covered confusion over the primary process, U.S. policy toward Ukraine, the Ukrainian community in Miami, and whether or not Americans can "buy" a driver's license (i.e., can you obtain one by paying a bribe). Nevertheless, one thing was clear: historically, the American media presence in Ukraine has been very limited (and vice-versa). While the U.S.-funded Voice of America and Radio Free Europe/Radio Liberty were for decades the de facto, nearly exclusive Washington and foreign bureaus for Ukraine's media market (where they typically partnered with all-news stations) that situation is changing. Now 1+1, Ukraina TV and ICTV, commercial broadcasting giants, are also regularly airing stories about American life, produced by Ukrainian, Washington-based correspondents. While Ukraine's media situation is far from perfect we're beginning to see a steady improvement. The usage of social media and personal blogs as organizational tools during the early stages of the Maidan demonstrated the power of peer-sourced information. Despite the fact that much of Ukraine's media remains under oligarch control, there is now more openness in TV coverage as compared to life under ousted President Yanukovych. (including the information about off-shore accounts recently found in the "Panama Papers"). Still, Russian media presence in Ukraine remains a concern. Roundtable with Lesia Vasylenko, founder of Ukrainian NGO "Legal 100"
The U.S.-Ukraine Foundation hosted a roundtable with Lesia Vasylenko, a young, proactive change-driven social activist, who is also the founder of Legal100 - an NGO that provides support to Ukrainian soldiers and their families. Lesia talked about the creation of the organization and challenges her team faces daily at the Foundation on October 27th, 2015. Legal100 is working on distributing legal information to those who are in urgent need of it. Unfortunately, most of the soldiers don't know their rights. Vasylenko says that she is worried about ATO fighters who come home and don't know how to get legal support. Their sense of justice tells them to defend their rights as veterans. Vasylenko is concerned that, not knowing a better way to do it, they will turn to arms. She also sees it as a moral responsibility to "protect the protectors of Ukraine." Distributing information - including phone consultations, educational videos on relevant legislation, and printed materials for those in the regions without access to the Internet. Building a network of veterans - bringing these people together, so that they can help each other and be better prepared to defend their civil rights. Even though, the situation in Eastern Ukraine looks less worrisome today, the number of calls Legal100 receives only grows as the soldiers come home. After only 16 months since being founded, Legal100 has 266 lawyers, 24 regional coordinators and 17 notaries working in Kyiv and other regions. There is a hotline that receives up to 40 calls per day requesting information on the social rights of the soldiers. Volunteers either provide necessary information via phone or refer the caller to one of the legal professionals registered in their database. These lawyers provide legal support pro bono. Ms. Vasylenko also noted that the ultimate goal at this point is to draft legislative proposals. She deals with many legal cases and sees multiple drawbacks in the outdated military law. Having to deal with numerous cases of the ATO soldiers, Vasylenko and her team have the first-hand knowledge of the legal gaps of the current legislation. She emphasized the need for systematic change and she is dedicated to working on legislative proposals that would better correspond to the needs of new veterans. We wish Lesia Vasylenko best of luck in her challenging work and hope for future cooperation with her. Iuliia Malieieva is a graduate student at The George Washington University's Elliott School of International Affairs. She is seeking a master's degree in international economics by May 2017. "Everything depends on the God, but we should also act" - this was one of the key thoughts that his Holiness, Patriarch Filaret shared with the audience during his visit to U.S. - Ukraine Foundation on February 6th 2015. Patriarch Filaret, the Head of the Ukrainian Orthodox Church of Kyiv and All Rus'-Ukraine shared his views on the conflict in Ukraine and explained why the Ukraine Freedom Support Act should be implemented. He started off by trying to explain why about 80% of Russians are ready to fight for Ukraine. It was stated that, just like Gorbachov, Putin cannot imagine a strong Russia without Ukraine. Representatives of the Russian political elite do not see Russia just as any other country; they want to create a world's superpower. The majority of Russian citizens seem to like that idea, but in order to achieve this status Russia needs to restore the control over quite a few Eastern European countries. Thus, we can see that implementation of the Minsk Protocol was not something Russia was looking for. Putin's plan possibly includes not only occupation of Crimea and Donbass, but also occupation of Kyiv, Warsaw, Vilnius etc., and the only way to stop him could be providing necessary aid to Ukraine. His Holiness mentioned that while there is a lot of enthusiasm among the Ukrainian armed forces, a lack of lethal weapons makes it hard for the Ukrainian soldiers to defend their land. Much of the weapons that are currently in possession of the Ukrainian military are outdated. Ukrainian armed forces have to use old Soviet-era equipment to battle Russian forces. What can happen if the Ukraine Freedom Support Act is not implemented? It could lead to more aggression and even World War III since it seems unlikely that Putin will stop after he seizes Donbass. Can providing military aid to Ukraine lead to the same consequences? One of the questions asked to Patriarch Filaret was: "Can providing weapons to Ukraine have an effect of adding oil to a fire and lead to even more violence?" His Holiness replied to this metaphorical question with a great metaphorical answer: "You can hold the oil in your hand without pouring it into the fire". Some would question the right of a religious figure to even ask the USA for weapons, His Holiness stresses that he is not a politician, and he hopes that knowing that Ukraine has real support from the West, could possibly cause Russia to rethink its actions and eventually bring peace to the region. Patriarch Filaret also touched upon the topic of religion. He talked about the tension that exists between the Kyivan Patriarchate and the Moscow Patriarchate. According to his Holiness, "A country cannot exist without a national and religious base". Unfortunately, the Moscow Patriarchate has had a great influence on some people in Ukraine, especially in the eastern parts of the country and Crimea, which led to the destruction of this base and a major misunderstanding between people living in different parts of Ukraine. At the moment there is no religious freedom in Donbass, and churches that belong to the Moscow Patriarchate, are the only religious institutions that still function in that area. They also have been the only religious institutions which have been reluctant in showing support for the Ukrainian army (Mitropolit Onufrie says that collecting the money will emphasize the weakness of the Ukrainian army). Meanwhile, Ukrainian Orthodox Church of Kyivan Patriarchate, Ukrainian Greek Catholic Church, the Roman Catholic Church in Ukraine and Protestant churches in Ukraine have all shown support for the Ukrainian armed forces. Another great point made by His Holiness, Patriarch Filaret, was that Russia is not the biggest enemy of Ukraine at the moment. The biggest enemy, according to him, is corruption. Unfortunately, even after the Revolution of Dignity, there are still some members of Verkhovna Rada (Ukrainian Parliament) as well as representatives of local administration in different cities and towns in Ukraine, who belong to the old Ukrainian political system that could be characterized by an extremely high level of corruption. Rebuilding and reforming the system in just one year is impossible, which means that Ukraine still struggles with its biggest enemy. Hopefully, Ukraine can defeat this enemy and transition to being a thriving democracy. The meeting was concluded with a prayer. It was a prayer for peace, a prayer for Ukraine, a prayer for all of us. 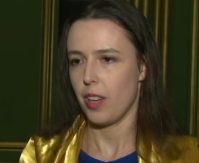 Oxana Parsons serves as a U.S.-Ukraine Foundation volunteer. Opinions expressed herein are those of the writer and do not necessarily represent the views of the U.S.-Ukraine Foundation. Ms. Parsons can be reached at okhristich@gmail.com. Patriarch Filaret, the head of the Ukrainian Orthodox Church of Kyiv Patriarchate, came to Washington to attend the National Prayer Breakfast. His itinerary included other meetings as well. And like a year before, His Holiness paid a visit to the U.S.-Ukraine Foundation to meet with Friends of Ukraine. Below, I summarize my impressions from the Patriarch's public appearances, both at our meeting at USUF and elsewhere in the Nation's Capital. Despite his age, Filaret is a keen thinker and an energizing speaker. An audience of political experts at the Atlantic Council listened to him intently for over an hour and gave him a round of applause in the end. His speaking style reminds the listener that the pontiff is a former teacher: he covers difficult subjects in simple and eloquent words, and his thoughts are articulated lucidly and crisply. A year ago, during the Maidan protests, Patriarch Filaret famously said, "The church must be out of politics. But it has to be with the people." His church consistently follows this principle. St. Michael's Cathedral - a temple of the Kyiv Patriarchate nearest to Maidan - gave refuge to young protesters beaten by riot police at the start of the anti-Yanukovych revolution. Two months later, in the days of the uprising, St. Michael's monastery opened an infirmary for the wounded. By the same token, Filaret gets featured these days in a weekly program on Ukraine's TV Channel 5, "Dialogs with the Patriarch." In those soulful conversations, he holistically connects questions of faith with citizen virtues. Does Christianity have room for patriotism? Yes it does; it teaches to defend your land and your people. How do we face good and evil in our daily lives? We make daily choices between truth and lies. How to reconcile Christian forgiveness with hatred to enemy at war? We must hate Putin's aggression, for it is an evil and sinful deed, explains the Patriarch; but we can pray for Putin's soul asking God to forgive this sinner. He shared the same holistic thinking while speaking in Washington. We do not claim a role in politics, he said, but we understand that people are driven by ideas, and in the domain of ideas they can seek guidance from church to distinguish between truth and lies. The Patriarch eagerly discussed political history as a source of moral lessons. Moscow's idea of Rusky Mir ("the Russian World") is an example of lies and falsehood; nice packaging for the idea of a new Russian empire. The Patriarch also spoke at length comparing Hitler's course to World War II with Putin's course today. He emphasized that both Hitler and Putin used lies to cover their aggressive aspirations, and that Western powers must not make the same mistake again. He also stressed that Ukraine, by confronting the Russian aggressor, was defending not only itself, but the rest of the world as well. He continuously reminded about security assurances given to Ukraine when it was dismantling its nuclear arsenals. As the Patriarch pointed out, helping Ukraine with defensive weapons now is the right moral choice for the U.S.; but besides, that choice must also be driven by concerns of international security and the need to save international trust in the United States. Many decades ago, Filaret began his rise in the Orthodox Church hierarchy owing to his success in theological scholarship. In late Soviet days, he used his considerable influence to gain an autonomous status for the Ukrainian Orthodox Church; yet, when he pressed for its full independence (the autocephalous status), this caused a bitter conflict with Moscow. 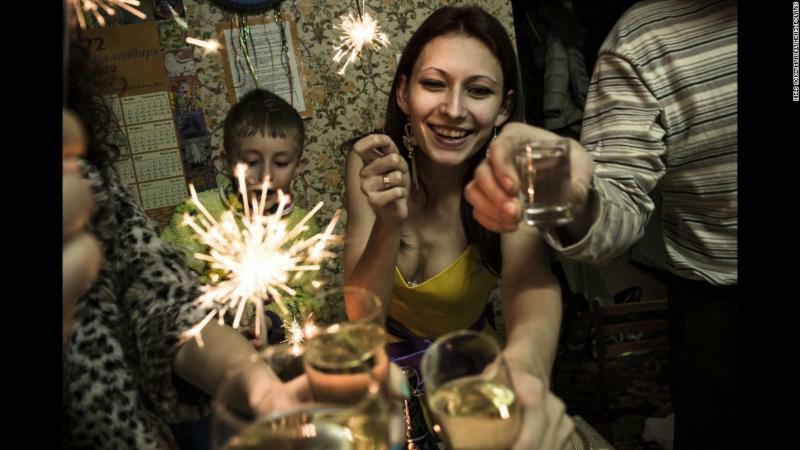 Looking back at Ukraine's post-Soviet history, one can view that as a step of providence. For more than two decades after that, Ukraine's politics was plagued by "the creole syndrome" of uncertainty and ambiguity in relations with Moscow. But Filaret resolved that uncertainty for himself and his followers when breaking off from Moscow in 1992. That act of great moral courage may be seen, in fact, as a precursor of the break up with Moscow that took place in the minds and souls of millions in 2014. In due time, history will fully appraise how much Filaret has done for his country. But no doubt, the Church of Kyiv Patriarchate was able to fend off at least some of the subversive Russian influence that came via the Moscow-controlled church, UOCMP. Since 2004, UOCMP became an openly "anti-Orange" political player in Ukraine. "Putin would not have seized the Crimea if our church had been there all along instead of the Moscow church," remarked the Patriarch. He confirmed that UOCMP was losing numbers of its faithful. Filaret quoted statistics showing that over 50% of the Orthodox faithful attend the temples of the Kyiv Patriarchate, whereas UOCMP has only a third of them. However, UOCMP has a bigger number of registered parishes - because, said Filaret, under President Kuchma the government wanted to register a UOMCP charter in every village across the country. It is not surprising that people would like to switch from the Moscow Patriarchate to the Kyiv Patriarchate, said Filaret. They can do this easily in cities where there are temples of both denominations - and that is how this should be. Conflicts and animosity arise only if there is but one temple in a village, and the community is divided. But the situation would change as soon as the Ecumenical Patriarch officially recognizes the Kyiv Patriarchate as an autocephalous church. In that case, according to Filaret, big numbers of parishes, with their clergy and faithful, would switch from Moscow to Kyiv. Clearly, Moscow will resist that as much as it can. Once there is a united autocephalous Orthodox Church in Ukraine, it will easily surpass the Russian Orthodox Church in size and influence. According to data earlier quoted by Patriarch Filaret, only 5% (or 8 million people) in Russia go to a church on Easter; whereas in Ukraine, that number is 25% (or over 11 million people). Accordingly, the ROC has about 12 thousand parishes and 67 dioceses, while in Ukraine there are 15 thousand Orthodox parishes and 87 dioceses. If the two Ukrainian churches unite, Russia will cease to be world's biggest nation of the Orthodox Christian faith. The Patriarch is convinced that the European choice of the Ukrainian people means an important role for the church in defining the nation's new European identity. He emphasizes that the European values are deeply linked to traditional Christian values. Christian faith and Christian values, according to him, must help in creating a united Europe that would have enough power to stop and defeat an aggressive adversary who tries to challenge those European values - like, for instance, Vladimir Putin. Written by Peter Voitsekhovsky, Ph.D., Research Director at the U.S.-Ukraine Foundation. Opinions expressed herein are those of the writer and do not necessarily represent the position of the U.S.-Ukraine Foundation. Dr.Voitsekhovsky can be reached at: pvoit@usukraine.org. Washington, DC, Dec 18, 2014 - We have all been following the crisis and war events in Ukraine for over a year now. Being far from the place where the events happen makes it hard at times to figure out what exactly is going on. That is the reason why, given a chance, we try to talk to someone who has recently visited Ukraine, or lives there, and has a chance to communicate with policymakers and others, regarding the newest and most dramatic events shaping Ukraine's history. We had a chance to talk today about Ukraine with our very special guest, Mykola Vorobiov, a Ukrainian journalist, who had spent nearly two months reporting on the fighting in Eastern Ukraine. In his presentation, Mykola provided an overview of what he saw in the field and described the current situation in Ukraine. Much of Mykola's presentation was devoted to information, including statistics, on both sides of the conflict. He informed us about Ukrainian volunteer battalions and their leaders, as well as his journalistic coverage on who is fighting on the pro-Russian side. Mykola also talked about some of the mistakes that were made during the fighting, including the Battle of Ilovaisk, which resulted in many casualties. The presentation was followed by questions from the attendees. Many of them were quite well informed about the situation in Ukraine, which resulted in a very interesting and beneficial discussion on the current events in Ukraine. 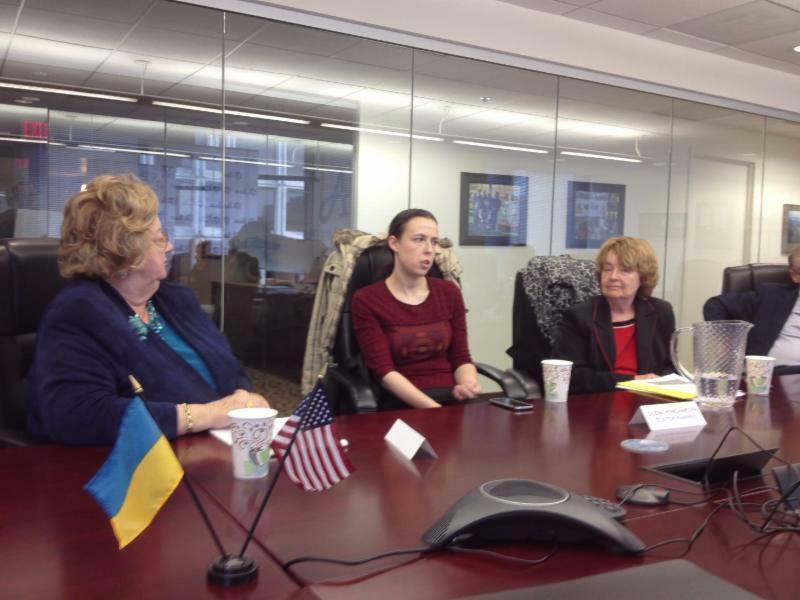 November 14, 2014 - A group of "field commanders" of Ukraine's volunteer outfits attended a round-table discussion at the U.S.-Ukraine Foundation today. They are known as the heroes who saved the country from a military defeat last summer in the face of Russia's invasion. The celebrated guests met with a stellar panel of experts and civic leaders who comprise the Friends of Ukraine network in the Nation's Capital. The "field commanders" delegation was led by two legendary figures, Andriy Teteruk and Yury Bereza. Both of them are newly elected members of Ukraine's parliament. They are a part of the "new political class" that is the embodiment of the country's hope for change. Arguably, it was owing to such candidates as Teteruk and Bereza that the party they represented - Popular Front - was able to gain twice more votes than predicted and even win a plurality in party lists' competition last month. In the spring of 2014, both Andriy and Yury were among those who organized the first units of volunteer fighters to confront and contain the spread of Russia's military aggression disguised as "local separatism." At that time, Ukraine's army was not prepared to fight back an invasion from Russia - neither logistically, nor psychologically. But patriotic volunteers organized their own "battalions" (which, however, tremendously varied in size and structure), and those formations spearheaded the resistance effort. It is a misconception, however, to see their fight as an "amateur" effort. In reality, both Andriy Teteruk and Yury Bereza were career military officers who chose an early discharge from active duty. Their story is a good example of the peculiar trend of post-Soviet development that placed the best professionals in many spheres outside "the system." The comeback of professionals like Teteruk, Bereza and all the others in their delegation may be a sign that Ukraine begins, at last, to reinvent that faulty "system." The field commanders are in Washington to call for continued and expanded U.S. support to Ukraine. At this time, the Russian side fights with newer and more advanced weapon systems, with more fire power and better targeting capabilities. The guests discussed those issues expertly and persuasively. They were less savvy on issues of world politics that some U.S. experts were raising in the discussion. However, they clearly maintained: if modern defensive weapons had been supplied to Ukraine last summer, this would have changed the balance of forces in Ukraine's favor, and the outcomes would have been different. "The only thing that can deter Putin's aggression is the number of Russian soldiers that get killed in the war," explained the field commanders. Concurrently with the discussion hosted by the U.S.-Ukraine Foundation, the same issues were discussed by world leaders who met in Australia for the G20 summit. Vladimir Putin received a strong signal there that should caution him from attempts to re-heat the military conflict - in which Ukrainian soldiers continue to die almost every day. Another powerful signal should be a promise of the U.S. to supply some weapons systems to Ukraine - which is a possible outcome of Vice-President Joe Biden's visit to Ukraine this week. The Center on Global Interests sponsors a presentation, Ukraine Elections: An End to the Crisis?, on Oct 22 which includes USUF's Board Member and former U.S. Ambassador to Ukraine, William Green Miller (seated at right), and Research Director Peter Voitsekhovsky (left). Moderator Konstantin Avramov, Program Director at the Center on Global Interests, is seated in the middle. An Ad Hoc Committee, composed of representatives from Ukrainian-American organizations in the Washing-ton, DC area, met for the first time on Friday, October 10th, to discuss and pursue "strategies for Ukraine's defense & future." The 2+ hour meeting included such organizations as the Center for US-Ukrainian Relations, U.S.-Ukraine Business Council, Razom, The Washington Group, Ukrainian Congress Committee of America/UNIS Office, Ukrainian National Women's League of America (via Skype conferencing), U.S.-Ukraine Foundation and others. The meeting moderator was Mykola Hryckowian of the Center for US-Ukrainian Relations. Prior to the meeting, special guest Oles Zhuravchak, Deputy Minister of Culture for Ukraine, provided comments on the current situation in Ukraine. 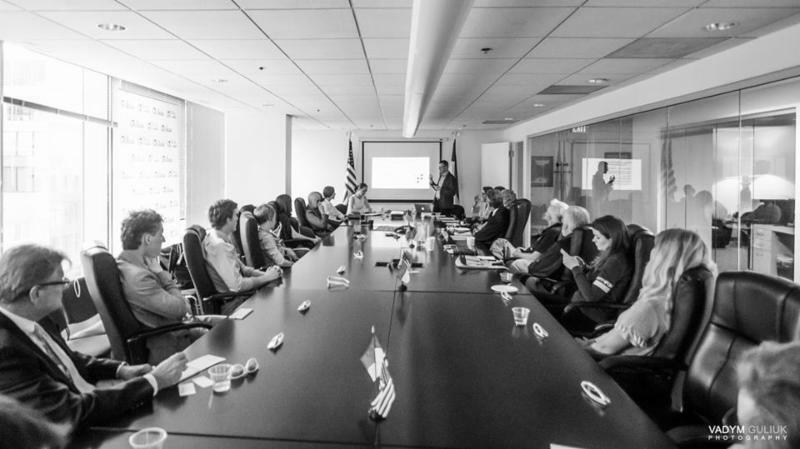 He is shown in the accompanying photo, sitting alongside Oresta Starak, First Secretary (Liaison with Ukrainian Community) of the Embassy of Ukraine to the U.S.
Monday, October 6, 2014 - The Foundation's conference room was the meeting site for the presentation, "New Ukraine, New Naftogaz - Ukraine's Gas Sector Reform," by Naftogaz representatives, Andriy Kobolyev, CEO, Yuriy Vitrenko, Managing Director, International Business and Aliona Osmolovska, Head of Public Relations, before members of the U.S.-Ukraine Business Council (USUBC), which sponsored the event. Lada Pastushak, Director of Operations and Development for USUBC, led the event. The U.S.-Ukraine Foundation is a member of the U.S.-Ukraine Business Council. Staff member Oksana Yakovenko attends two-day symposium, Diverse Landscapes of Ukraine: Celebrating Twenty Years of Ukrainian Independence, on the campus of The Pennsylvania State University at University Park, PA.
USUF President Nadia McConnell speaks on Ukraine's election to Secure Freedom audience. U.S.-Ukraine Foundation’s Vice President Markian Bilynskyj attended the first Black Sea Youth Summit in Istanbul, organized by the Turkish ARI Movement. As a co-organizer, USUF was responsible for identifying the Ukrainian participants on the basis of an essay competition where the contestants were asked to identify their priority concerns for the future development in the Black Sea region from a youth perspective. The Ukrainian participants were Maryna Burdun from Kharkiv, Maryna Andreeva from Khmelnytsky, and Vsevolod Samokhvalov from Odesa, who won the first prize of 500 Euros for the best essay. As part of the Project to Assist Ukraine’s Civil Service Reform, the U.S.-Ukraine Foundation hosted delegates from Ukraine’s Ministry of Foreign Affairs from November 12-17. October 4, 2008 - Ambassador of Ukraine Oleh Shamshur and US-Ukraine Foundation President Nadia McConnell sign agreement to promote tourism in Ukraine. September 29, 2008 - Nadia McConnell meets with President Yushchenko at USUBC meeting. Sept 25-Sept 29 - Key Ukrainian and U.S. policy makers participated in this year's session. Video of the opening and closing plenary sessions are available. October 28 - "USAID's Bizarre Policies and Ukrainian Americans"
September 16 - The Ukrainian Weekly’s editorial about the U.S.-Ukraine Foundation: "Fund the USUF"
CSDU meeting with Oleh Bilorus – Bloc of Yulia Tymoshenko; Oksana Bilozir – “Our Ukraine”; Leonid Kozhara – Party of Regions. CSDU met with Ruslana Lyzhychko, Member of Ukraine’s Parliament, to discuss the political, economic, and social situation in Ukraine. October 17-18 -- Ukraine's Prospects for NATO Membership - Roundtable conference, co-sponsored by the U.S.-Ukraine Foundation, took place in Washington, DC. Washington, DC - The U.S.-Ukraine Foundation has launched its Webcasting Series to commemorate the 15th anniversary of the Foundation. September 25- 29 -- Washington, DC – The U.S.-Ukraine Foundation and its partners hosted the third working session of the U.S.-Ukraine Policy Dialogue in Washington, DC from September 25 – September 29, 2006. Funded by the U.S. Department of State, the U.S.-Ukraine Policy Dialogue is designed to supplement and deepen the official bilateral dialogue between Ukraine and the United States. More than 60 policy makers from the United States and Ukraine met to discuss U.S.-Ukraine relations through the prism of foreign policy and national security; politics and governance; media and information; and business and economics. June 11-16 -- The U.S.-Ukraine Foundation hosts Tymofiy Motrenko, Head of Civil Service of Ukraine, Andriy Vyshnevsky, Director of the Center for Support of Civil Service Institutional Development, Main Department of Civil Service of Ukraine, and Oleksandr Demyanyuk, Head of the Personnel Management Department, MFA of Ukraine as a part of its project to assist Ukraine's Civil Service Reform in its stated goals of improving personnel management systems. 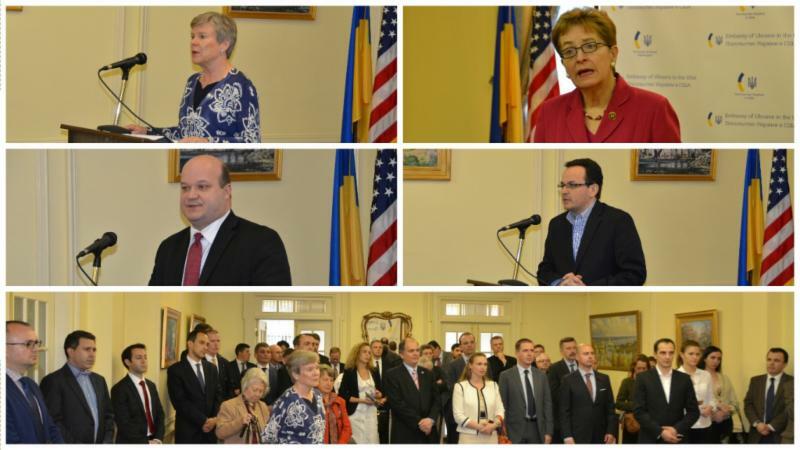 June 5 -- The staff members of the U.S.-Ukraine Foundation attend a swearing-in ceremony of the newly appointed U.S. Ambassador to Ukraine, William B.Taylor, Jr.. Condoleezza Rice presides the ceremony that takes place at the U.S. Department of State. November 10-12 -- John A. Kun, Vice President USUF, speaks with Ukrainian-Americans in Anchorage, Alaska. it is time for the President, democrats and republicans, together, to graduate Ukraine." November 1 -- The Jackson-Vanik Graduation Coalition meets to continue developing a strategy to encourage the US Congress to graduate Ukraine from the Jackson-Vanik Amendment trade restrictions. The list of Coalition Members has grown to over 30 national and regional Ukrainian-American and Jewish-American groups, businesses and NGOs. October 31 -- Noelle Budwig, U.S.-Ukraine Foundation staff attends the U.S.-Ukrainian Investment Symposium at the Harvard Club of Boston. This inaugural celebration of Ukraine's progress towards economic integration is enlisting the participation of government leaders, corporate executives, investment fund managers, and decorated scholars for an unprecedented look at the state and prospect of Ukraine's integration with the global economy. October 17 -- The Jackson-Vanik Graduation Coalition, of which the U.S.-Ukraine Foundation is a key partner, holds its first planning meeting in Washington, DC. In attendence at the meeting are Nadia McConnell, U.S.-Ukraine Foundation President, John Kun, Ulyana Panchishin, Juan Carlos Campos, Christina Redko, and Alana Malick. Headed by former U.S. 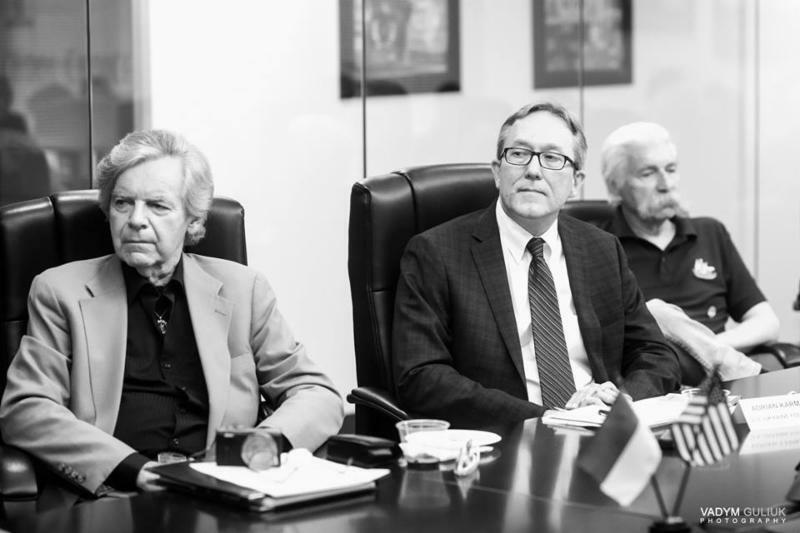 Ambassadors to Ukraine, Steven Pifer and William Miller, the Jackson-Vanik Graduation Coalition is working to achieve Ukraines graduation from the Jackson-Vanik Amendment before the November 2005 Congressional recess. Coalition leadership will soon be meeting with key members of Congress and the White House. Congress is currently considering a total of six bills that would graduate Ukraine from Jackson-Vanik and extend permanent normal trade relations status to Ukraine. All six bills have been referred to committee and await consideration. For more information, or to participate in the Coalitions efforts please email JVGC@usukraine.org. October 13 -- Foundation staff host a meeting at the DC office with Alexei G. Kozhenkin, Managing Director, IT - Ukraine Association, who is visiting Washington DC and Fairfax Country as part of a Ukrainian (IT) delegation sponsored by the Fairfax County Economic Development Authority. Jan E. Mul, Manager, European Business Development, accompanies Kozhenkin for the meetings. The IT industry in Ukraine is discussed, as well as ways to collaborate with the Foundation and the Fairfax County EDA. October 8-11 - The U.S.-Ukraine Foundation hosts the 2005 Ukrainian American Youth Association (CYM) Youth Leadership Seminar. John Kun, USUF Vice President and Chief Operating Officer, opens the conference with welcoming remarks. Seminar speakers include Bo Shevchik, Financial Advisor at UBS and former General Manager of Coca-Cola Ukraine, Eugenia Kuzmowycz-Blahy, Chief Operating Officer of Self Reliance NY Federal Credit Union; Andriy Bihun, Director of Youth for the Ukrainian American Youth Association; Mykola Hryckowian, Founder of the Center for U.S.-Ukrainian Relations; Jerry Dutkewych, Director of Country Relations of the Millenium Challenge Corporation, Diana Howansky, Staff Associate at the Ukrainian Studies Program at Columbia University, and Marta Matselioukh, M.A. candidate in Eurasian, Russian, and East European Studies at Georgetown University, and U.S.-Ukraine Foundation Administrative Assistant. Lida Mykytyn, former Organizational Director of the Ukrainian Am erican Youth Association, is key in organizing the seminar. The seminar's participants, high school juniors and seniors from various parts of the United States, are Christina Drozd, Chicago, IL; Marko Diaczun, Strongsville, OH; Simon Kazarenko, Brooklyn, NY; Natalya Kuzewych, Philadelphia, PA; Andrea Popovech, Astoria, NY; Monica Sawchuk, Scarsdale, NY; Yuriy Symczyk, Union, NJ; Michael Ushak, Tenafly, NJ; and Alexandra, Szkafarowsky, Yonkers, NY. October 6 -- Nadia McConnell hosts a meeting at the DC office for twelve visiting press and mass media representatives from Ukraine. Alla Rogers, Co-Chair, National Press Club's Task Force on Journalism in Emerging Democracies, accompanies the representatives from Ukraine on their five day work session hosted by the National Press Club. September 29 -- Foundation staff attend the Ukraine - U.S. Business Council's first Washington, DC, "Members and Friends Networking and Sherry" event at which Michael Bleyzer, CEO, SigmaBleyzer is a guest speaker. Michael Bleyzer discusses SigmaBleyzer's experience investing in Ukraine. September 28 -- Foundation staff attend "HIV/AIDS Epidemic in Russia & Ukraine: Strategies for Business & Government Response" at the USA Trade Center in Washington, DC. September 27 -- Vera Andrushkiw, CPP director, attends "Ukraine's Quest for Mature Nation Statehood - Roundtable VI: Ukraine's Transition to an Established National Identity," Washington, DC. September 26 -- Alana Malick, Foundation Fellow, attends a lecture at the Kennan Institute, by Alexander Motyl, Deputy Director of the Center for Global Change and Governance and Professor in the department of Political Science at Rutgers University. The lecture is entitled, "Two Cheers for Stagnation - Institutional Development and Democracy in Ukraine and Russia." September 23 -- USUF staff attend the breakfast briefing, "The Role of Local Governments in Consolidation Democracy in Ukraine," at Radio Free Europe/Radio Liberty (RFE/RL) in Washington, DC with Oleksandr Popov, Mayor, Komsolmolsk (Poltava region), Ukraine and Volodymyr Udovychenko, Mayor, Slavutych (Kyiv region), Ukraine. In the afternoon, the mayors and Vera Andrushkiw, CPP Director, meet with Dr. Kent Hill, Assistant Administrator of the USAID Bureau for Europe and Eurasia, Marilyn Pifer, Senior Technical Advisor and Senior Program Manager for Basic Research and Higher Education Program at U.S. Civilian Research and Development Foundation, and George Chopivsky, Chairman, Ukrainian Development Company, L.L.C. September 22 -- Vera Andrushkiw, CPP Director, Mayor Oleksandr Popov, Komsomolsk, and Mayor Volodymyr Udovychenko, Slavutych, meet with Robert D. Persiko, Youth Programs Division Chief at the Office of Citizen Exchanges of the Department of State, Marcy Kaptur, Congresswoman, William Hudnut, Mayor of Chevy Chase, MD, and Alan Cohen, former Mayor of Ithaca, NY. September 21 -- A Congressional Breakfast co-sponsored by the Ukrainian Congressional Caucus and the U.S.-Ukraine Foundation is held at the Rayburn House Office Building. Introductions are by Nadia McConnell. Opening remarks are by Representatives Marcy Kaptur (D-OH) and Curt Weldon (R- PA). Keynote address is by Dan Rosenblum, Deputy Coordinator, Department of State Office of the Coordinator for U.S. Assistance to Europe and Eurasia. Later in the day, participants from the CPP conference attend meetings with Congresswoman Nita M. Lowey, Congressman Maurice Hinchey, and Jeffrey Finkle, President and CEO of the International Economic Development Council (IEDC). September 20 -- This marks the first day of the CPP conference in Washington DC. The guests of honor at the conference are Mayor Oleksandr Popov, Komsomolsk and Mayor Volodymyr Udovychenko, Slavutych. Other participants include approximately 25 trainers from the CPP U.S. partner cities. Nadia McConnell opens the conference. Panel 1 is titled: "Economic Development, Above and Beyond CPP." Panel 2 is "Housing and Communal Service, Above and Beyond CPP." September 13 -- The Foundation hosts a lunch meeting at the DC office for the Vital Voices Global Partnership delegation of the Open World Leadership Centers Ukraine. The delegation consists of 8 participants and 2 facilitators of emerging women leaders working with NGOs, CBOs, and government. It is facilitated by Natasha Marks, Associate Director, Global Leadership Institute, Vital Voices Global Partnership. September 8-11 -- CPP holds the Economic Development Clusters Internship in Washington, DC. The Ukrainian participants consist of city officials and members of business and entrepeneur associations. One highlight of the program is the meeting with Stanley Jackson, Washington, DC, Deputy Mayor on Planning and Economic Development. August 17-18 -- The former Mayor of Kyiv, Oleksandr Mosiyuk, visits with Nadia McConnell and other staff and interns at the Foundation. Mayor Mosiyuk meets with former Senator Joe Tydings. He is visiting Washington DC on a research project sponsored by the Kennan Institute. August 7, 2005 - USUF is favorably reviewed in "A Guide to Who's Who in D.C.'s Ukraine-Related Activities"
May 22 -- USUF President Nadia McConnell visits Chicago at the invitation of Anna Mostovych, President of The Chicago Business & Professional Group, to give a presentation at the Ukrainian Institute of Modern Art. Mrs. McConnell speaks on Building and Sustaining Democracy in Ukraine: The Role of NGOs. 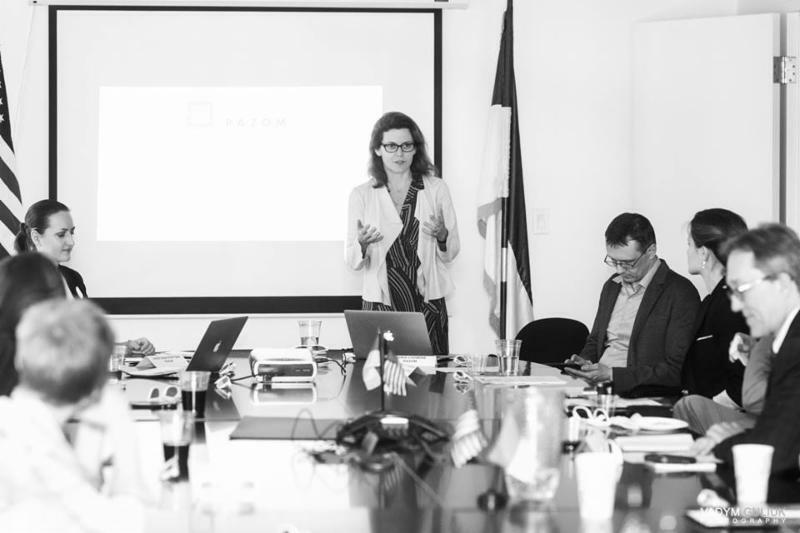 During her talk she describes the work done by the Foundation through its various projects, specifically highlighting the activities of the Foundation’s Election Project, which helped to ensure a more democratic presidential campaign and election in Ukraine. April 15 -- USUF Vice-President/COO John A. Kun visits Chicago in April. Mr. Kun had the chance to see and thank Julian Kulas, head of The Heritage Foundation of MB Financial Bank (formerly First Security Federal Savings Bank), and Bohdan Watral, President/CEO of the Selfreliance Ukrainian American Federal Credit Union, for their continuing, major support for the Foundation’s programs. Mr. Kun also visits the Ukrainian Institute of Modern Art and the Ukrainian National Museum, where he receives individualized tours by Marijka Kulczycky and Maria Klimchak, respectively. Ms. Klimchak, who also operates the Ukrainian Wave program on Radio WSBC 1240 AM in Chicago (along with her husband Mykhailo), conducts an interview for the program with Mr. Kun. April 7-8 -- The Foundation expands its cooperation with the Chicago-based International Cultural Educational Association (ICEA). ICEA, in cooperation with the Sister-Cities International partnership between Chicago and Kyiv and the McCormick Foundation at the Chicago Tribune, initiated a program that gave a group of twelve Ukrainian journalists an opportunity to observe mass-media operations in the United States. The Foundation agreed to facilitate the two-day leg of their journey in Washington, DC. Financial and in-kind support by the Foundation totaled over $2,100. The majority of the translation was done by Ioan Onujec. March 13 -- A lecture by Dr. Lubonyr Luciuk, Adjust Professor in the Depratment of Geography and Fellow at the Chair of Ukrainian Studies at the University of Toronto, takes place at the Embassy of Ukraine. The topic is Ukrainian Diaspora -- Yesterday, Today and Tomorrow. March 10 –- The Minister of Foreign Affairs of Ukraine, Borys Tarasyuk, speaks at a luncheon at the International Republican Institute, participates in the commemoration of the 134th anniversary of Taras Shevchenko’s birth, and discusses Ukraine, the U.S. and the EU: The Partnership in Light of the Orange Revolution at The George Washington University. March 6 -- A report and slide presentation entitled Elections in Ukraine 2004 as seen by local observers is given by Judge Bohdan Futey, Dr. Roman Serbyn and Dr. Yaromyr Oryshkevych at the Ukrainian Catholic National Shrine of the Holy Family. March 3 –- Richard Green Lugar, U.S. Senator from Indiana, speaks on the topic of A Changing Ukraine at the Kennan Institute. 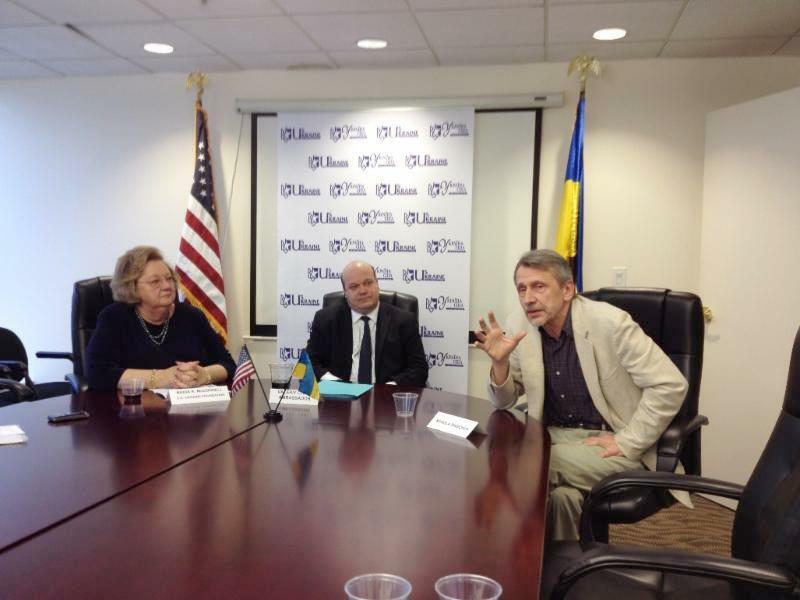 March 2-3 –- USUF participates in Ukrainian Days in Washington, DC, an event hosted by UNIS. The goal of “Ukrainian Days” is to promote the concerns of the Ukrainian-American community, and to establish stronger ties with Members of Congress. March 1 –- Antonina Berezovenko, Visiting Associate Professor at the Department of Slavic Languages at Columbia University, presents on The Rhetoric of Presidential Elections in Ukraine. The discussion, which takes place at the International Republican Institute, focuses on how language serves particular political goals, and influences certain social groups. Additionally, Dr. Berezovenko examines the public relations techniques relevant for today’s Ukraine. January 21 -- THE WHITE HOUSE, Office of the Press Secretary announces on January 21, 2005 that President George W. Bush today announced the designation of a Presidential Delegation to attend the Inauguration of his Excellency Viktor Yushchenko, President of Ukraine, on January 23, 2005. The Honorable Colin L. Powell, Secretary of State, will lead the delegation. Members of the Presidential Delegation are: The Honorable John E. Herbst, United States Ambassador to Ukraine, The Honorable Paula Dobriansky, Under Secretary of State for Global Affairs, Mrs. Vera M. Andryczyk, President, Ukrainian Federation of America, Mrs. Nadia Komarnyckyj McConnell, President, U.S.-Ukraine Foundation, and Mr. Myron Kuropas, Ph.D., Adjunct Professor, Northern Illinois University.January 19 –- International Republican Institute hosts a discussion about The Direction of President Bush’s Foreign Policy in the Second Term. January 19 –- The UNDP-sponsored Blue Ribbon Commission Report on Ukraine, titled Proposals for the President: A New Wave of Reforms, is launched at a breakfast meeting at Carnegie Endowment for International Peace. January 18 –- Ambassador Steven Pifer, Orest Deychakiwsky, and Oleksandr Potekhin have a lunch meeting with USUF staff. January 3-10 -- Art Exhibit of Nadiya Kyrpenko at the Woodrow Wilson Center. Ms. Kyrpenko works mainly in watercolors. Her works depict scenes of central Ukraine and Central Asia.